Woodworking artisans John and Jane Greenberg Kostick ’88 have created Tetraxis, a magnetic geometry puzzle for all ages. The Kosticks’ son James plays with the Tetraxis® toy. Inviting the inner child to re-emerge for playtime, the colorful displays at Toy Fair 2011 in New York enticed industry professionals to play hide-and-seek on three expansive floors. During mid-February, toy creators and merchants at the Jacob Javits Convention Center dazzled potential buyers with eye-catching gimmicks—from an inflatable remote-controlled flying fish to a shiny red, miniature piano and an oversized lego-constructed car. In a basement-floor booth, John and Jane Kostick encouraged visitors to play with their magnetic Tetraxis geometry puzzle. “If you put the pieces together in less than one minute, you’ll win a free one,” Jane said to Tom Cutrofello, mechanical puzzle correspondent for Games Magazine. Twelve identically shaped sticks, in four colors, magnetically connect in the Kosticks’ hands-on learning puzzle, which enhances the exploration of symmetry and color combinations. 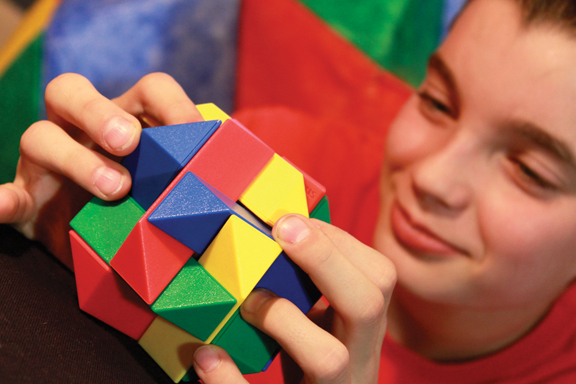 The toy increases spatial understanding; problem-solving skills; intellectual and manual dexterity; and intergenerational, interoffice, and intercommunity connections. On the first day of the fair, the crowd around the Kosticks’ table cheered Cutrofello and others, who claimed their prizes after solving the puzzle. Some recalled solving other math-based puzzles and used that experience to handle the Tetraxis challenge. “That’s a fun toy, especially when you get the method down,” says Jon Goehring, who runs Toyworks in Santa Rosa, Calif., with Cristi Ronchelli. The Tetraxis design, first crafted as bronze and wooden sculptures, is just one of the geometric constructions that the Kosticks have created. Their customized furniture, cabinetry, and garden accessories are also based on geometric configurations. Designers and woodworking craftsmen with an interest in mathematics, the Kosticks officially launched their new company, KO Sticks LLC, in August 2010. A pilot run of 2,000 toys, in the fall, quickly sold out. The next production in Xiamen, China, delivered the second batch in March for distribution in Switzerland and Australia, where the puzzle was displayed at another toy fair. A small community of artists, primarily furniture makers who work in cooperative studios in an old industrial building—where the Kosticks are based in Medford, Mass.—offered input on the package design. Some game players have even completed the puzzle blindfolded.